Used safely, a grill can be a fun way to make a delicious meal, but do you know how to properly place and use a grill? Grilling Safety…What You Need to Know! At Disaster Blaster, we often deal with Smoke and Fire Clean-Up and Restoration jobs, some caused by outdoor grills. Many of these disasters could have been minimized or avoided altogether if certain precautions and safety measures had been taken. From necessary safety equipment to proper placement, Disaster Blaster would like to help answer some common questions associated with grilling safety. We know, you are very excited to fire up that grill and get cooking, but we cannot stress enough the importance of reading the manual that came with the grill. According to the National Fire Protection Association (NFPA), grill fires account for 8,800 fires annually, 140 injuries, and 10 deaths! Damages caused by grill fires result in $ 96 Million in direct property damage each year. Fire can be unpredictable and flare up without warning, which is why we strongly recommend taking the time to learn about your grill and read through the safety information included in the manual. This may seem odd, but annually 6 % of grill fires occur indoors. In addition to this greatly increasing the potential to ignite flammable materials (furniture, drapes, structural components / drywall, etc. ), this also allows smoke and gases to build up inside your home; which may present a health hazard. This is incredibly dangerous. If you are for any reason unable to set up a grill in a safe place outdoors, we recommend using a grill pan on top of your stove instead. When selecting the perfect place for your grill, you should keep in mind that you want this to be away from structures such as sheds, fences, etc., and out from under eaves, porch roofs, or overhanging tree branches. Piles of leaves or other highly combustible materials should be well away from the location of your grill as well. Essentially, you want to eliminate any potential ignition opportunities in the event of a flare up. As you select the perfect place for your grill, you want to keep in mind the foot traffic that can be expected when you fire up your grill. People sure seem to come out of the woodwork when a grill fires up! For this reason, you should attempt to limit the flow of people past your grill location as best as you can, particularly children. Keep in mind that the grill is incredibly hot, and you don't want anyone to bump it accidentally. Likewise, when opening the cover, make sure that no one else is too close. Your grill should be placed on a flat, solid surface. This not only creates a secure place for your grill that will prevent it from rolling or tipping, but will result in more even cooking as well! So now you've got your grill placed and you're ready to get cooking! But in addition to the ketchup and mustard, what else should you have handy when grilling? Just as with cooking in your kitchen, you should always have a fire extinguisher close by when grilling. Please check out our tips for choosing a fire extinguisher, and its use. To protect yourself in the case of flare ups, a heavy duty apron and gloves are recommended as well. What if the fire goes out? It is important to realize that, just because the fire appears to have gone out, that does not mean there is no hazard. Ignition may still be possible, starter fluid or gas may still be present, and the grill will still be hot. One flame can result in ignition, and may result in a large combustion or flame up. Propane in particular is heavier than air, and can sit in a grill until ignited. • Gas Grills: As there is likely gas still in the grill itself, it is recommended to wait at least 15 minutes until attempting to reignite the grill. This will allow the propane to dissipate and reduce the risk of a dangerous flame up. Regardless, take caution whenever relighting a grill, standing back, and relighting it from a distance. Should a flame up occur, you want to be at a safe distance. • Charcoal Grills: Never add lighter fluid directly to coals that are already burning, even if the fire is dying or appears to be out. Instead, place two or three additional coals in a small metal can and add lighter fluid, then stack these additional coals on the previously burning coals using long handled tongs, and light them. These coals will restart the other coals in the fire. Regardless of the type of grill, grease buildup can present an ignition hazard, so it is recommended to clean your grill and the trays below the grill thoroughly. 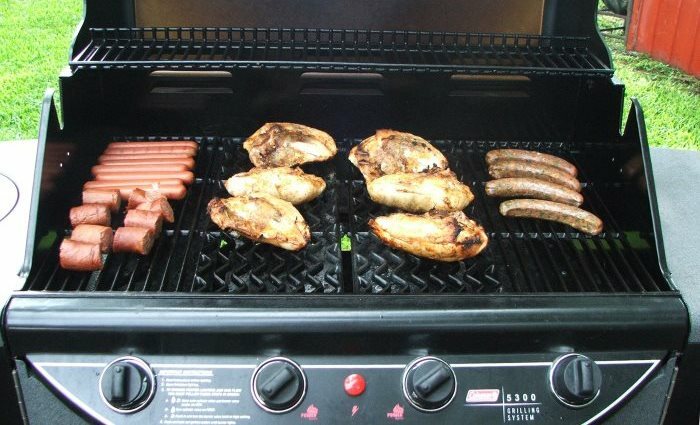 • Gas Grills: Check the gas hose for leaks before each use. While many times you may be able to hear or smell a leak, you may also check by applying a light soap and water solution to the hose and looking for bubbles. Should you find or believe there to be a gas leak, turn off your gas tank and grill immediately. Do not move the grill. If the leak stops, have your grill serviced by a professional before using it again. If the leak does not stop, contact your local fire department. • Charcoal Grills: Charcoals should be disposed of in a metal container after they have already cooled completely. • In case of an emergency, call 911. We hope you enjoy you're grill! Done safely, grilling can be one of the best ways to prepare a meal, and a great chance to catch up with family and friends. 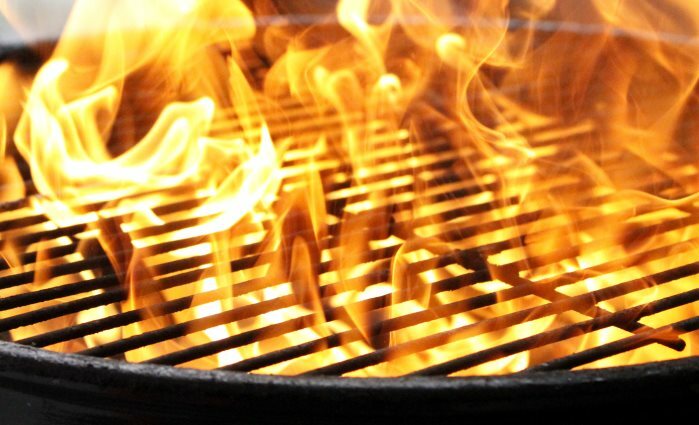 We certainly hope you won't have a flame up while grilling that results in damage, but if you do have a need for fire clean-up or any of our services, please Call Our Office and we will be happy to assist you.